You probably haven’t noticed because, like most things I do these days, it is happening verrrrrrrrrrrrrry slowly, but I am in the process of updating my website. I realised that the most recent photo of myself on this site is from 2013, and the self-portrait I used as an avatar on most platforms was older still. I no longer look quite the same (!) and nor does my work. It’s time for a change. I reflected back on some older self-portraits when thinking about ideas. I like them to show not only what I look like, but be created in my favourite medium of the time. This one, from 2009, was painted in gouache and the collage elements added digitally. 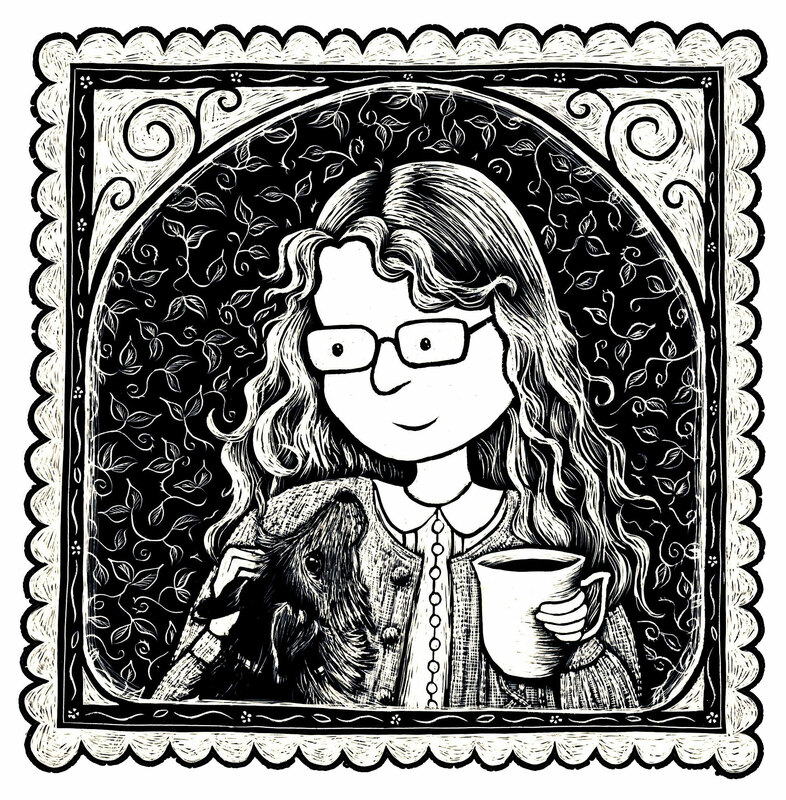 I really liked the postage stamp composition, and the presence of a cup of tea (true to life), so I decided to bring these into the new portrait (don’t you think I look a bit miserable though?). The portrait I’d been using most recently reflected the style of Lighter Than My Shadow, drawn in Micron pen with shading and texture added digitally. I suppose one could argue that Lighter Than My Shadow is itself one long self-portrait, and this one certainly looks like the ‘me’ at the end of the book. It includes glasses, but my hair has grown several inches since then! More importantly, after drawing 500+ pages in this style I’m kind of sick of working this way and it hasn’t been part of my drawing practice for quite a while now. I’ve been playing with lots of different media recently, especially scratch board. So that’s what I chose for the new portrait. Finally, of course, the new portrait needed to include the newest member of the family, whose presence is as important – if not more so! – than the perpetual cup of tea.